I've seen these jars all over Pinterest the last couple of months or so, sometimes called "mind jars" and sometimes called "calm-down jars", and thought they might be a fun craft to make with the girls. (Okay, okay, so I'm totally dating myself here, but they remind me of the plastic glitter wands from the 80s and I really wanted to make one for myself.) Basically, mind jars are a tool to help kids, or anyone, when they feel overwhelmed. They are clear jars (either glass or plastic) that are filled with a solution of liquid and glitter. The glitter represents all the troublesome thoughts that are creating the stress. They are shaken to mix up the glitter and as the glitter settles to the bottom, you are supposed to visualize the things that are troubling to you also settling. A note about Pinterest: when I pin things on Pinterest, I really try to click through to make sure that I'm linking to the original post so that the original blogger gets the credit (although sometimes it is hard). As far as I can tell, the post Meditating with Children on "Still Life with Circles", is the first post I can find about the jars. It refers to the book, Moody Cow Meditates that has a recipe for the jars in the back. There are also a couple of lovely, later posts on Mind Jars and Calm-Down Baskets at "Here We Are Together", which actually describes a different method of making them than from the book. The first couple we tried to make failed miserably. In one, we added the big, fat (cheaper) glitter and it, literally, settled in about 10 seconds flat. Not what we were looking for. In the second container, we added Elmer's White Glue, which turned it into an opaque mess. Also, not what we were looking for. So, a few days later, after looking at the different recipes and thinking about the science behind what makes them work we decided to make an experiment out of creating the glitter jars. We ended up testing the following six recipes. Yup, I know six is a lot. We kind of went overboard, but once we got on a roll we kept thinking of other ways to tweak the recipes and the girls were having fun, so we went with it. If you want to try this, you could definitely choose just 2 recipes, but make sure that you pick 2 that have fairly different approximate settling times so your child can really visualize the difference between the jars. The picture below is a pretty good representation of the settling rates of the different recipes. Step 1: Using a whisk, combine the hot water and the "thicker" substance (glue, corn syrup and/or glycerine). Whisk until the mixture is uniform - usually the glue takes a little bit of work to get the clumps all out. Pour the mixture into the jar you are using. Step 2: Add the glitter - we only used 1 color for each one, but you could definitely do more than one. (If you do use more than one color, don't be surprised if they settle out at a slightly different rate. Later, we made a jar with silver and pink and the silver definitely was slower at settling out; I'm not sure if that is due to different size or density of the glitter.) Put the top on and let your child shake the jar. 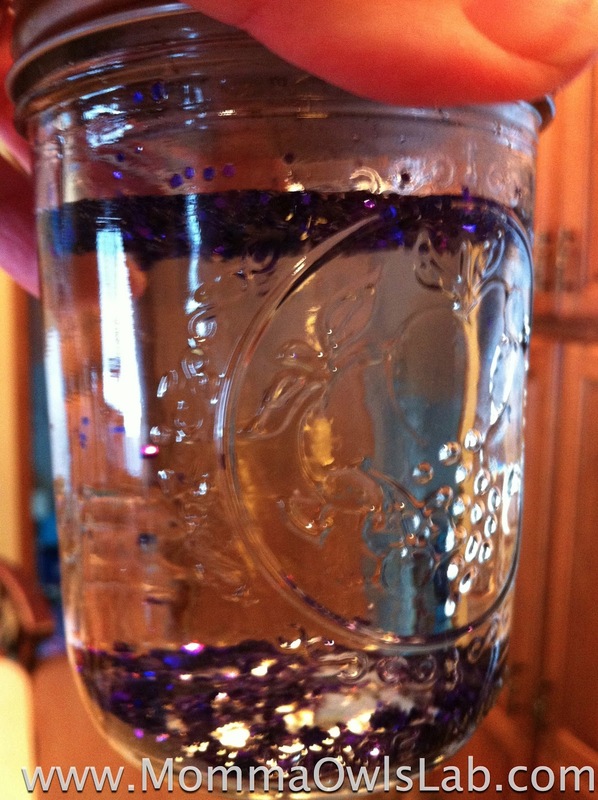 Step 3: You will notice that some of the glitter remains floating on the top due to the surface tension of the water. (See the picture below.) Carefully add 3-4 drops of liquid dish soap to the top of the jar (I recommend an adult do this part) and shake the jar again. You should see the glitter distribute much more evenly. Note: this picture is from our first failed attempt with the bigger glitter, but the fine glitter will float at the top as well due to the surface tension of the water. Step 4: Have your child predict which of the jars they think will settle first then shake the jars and test the prediction. You can even use a timer and label the jars with the time it takes each to settle. Then have your child place the jars in a line from the fastest to the slowest settling times. Have your child draw pictures and record any observations in a science journal. You could also have them make a graph of their results. A few final thoughts... It really didn't seem to make a difference whether we used corn syrup or glycerine (they both had about the same settling rate) and as corn syrup is much cheaper than glycerine, I would recommend using that. It does have a slight yellowish tinge to it, but we didn't notice it in the final product (and the glitter color slightly stained the solution anyway). You can't tell from the recipes above, but a while later we decided to add more glitter to one of the jars to see if that made any difference and it didn't really change the settling rate. We also decided to transfer our mixture into a recycled plastic jar for a couple of reasons. One, as you may know from an earlier post, I have recently become obsessed with canning so I jealously guard my mason jars. Also, the thought of the girls opening the glitter jars (and the mess it would create) is terrifying me so we transferred it to a small juice bottle that had the same volume. I plan to superglue the top so the girls can't open them. Now that we have our mind jars, I'm off to make a calm-down basket. And, maybe some glitter wands, too. There are three scientific concepts at play here: surface tension, viscosity and density. Surface tension is the cohesive force on the surface of the water that causes the water molecules to cling together. This creates both the typical circular shape of water droplets as well as a slightly more energized plane, or a surface "film", in which little things (like bugs or leaves) can walk or float. For a more in-depth explanation of surface tension you can go here, or for a wonderful kid-friendly explanation, check out Amy's (from "The Scientific Mom") explanation in her Bubble Magic and Teddy Bear Molecules post. We talked a bit about surface tension in our Rainbow Milk activity. Viscosity is a measure of how resistant a fluid is to flow. An easy way to think about it is how "thick" the liquid is at a given temperature. (Note that temperature does affect viscosity - think about what happens to honey when you heat it up!) Some examples of liquids with high viscosity are corn syrup, honey and motor oil. Some examples of liquids with low viscosity are water, vinegar and milk. Here's a viscosity chart to check out if you are interested. For older kids, I think it would be really fun to give them a design challenge. Explain the scientific basics behind the glitter jars, maybe even make a sample one but don't give them the specific recipes. Then tell them that you want them to make one that will settle in a designated amount of time, say 2 minutes. Have them record all the variations of their trials in a lab notebook. If they come up with multiple recipes that work, you could even have them calculate a cost analysis of the different ones and recommend one to produce. I hope you enjoy this activity! If you try it, please leave me a comment to let me know how it goes! We used the very fine glitter that Martha Stewart makes just because its what I had on hand. If you are having some stick to the top, did you use a little dish soap to break the surface tension? so, on the green glitter jar, you don't add any glitter? just glitter glue? what kind of glitter glue did you use? Hi Thomasina! It was just the glitter glue. It was one of the small jars from near the check-out lanes at JoAnn Fabrics. I can't recall the exact brand and I went back to my pictures from the day and those weren't any help in identifying it - sorry! I imagine lots of types would work but stay away from the ones that are opaque in the bottle but say they dry clear. Thanks so much for these recipes! What kind of jar were you using? Super glue is pretty caustic stuff. If you are using a plastic jar (like we were) the same company that makes super glue also makes a plastic fusion product. I'd check that out if I were you. Hope that helps! I have yet to start gluing but this has been a big thinking for me because I plan to start making them in bulk. There is the option of caulking then glueing or the other way around. But making sure the seal is clean, dry, properly threaded and has a chance to set for up to 27 hrs to properly set for the heavy duty glues is very important. I also saw one dealer put pretty duck tape around her voss lids to match her themes. Thank you for this! I'm going to make these today! Can you give me an idea of how long you think they'll last? Meaning, over time will the solution begin to dry up or become clumpy? Or will it remain the same for a while? Thanks! Well, I'm not completely sure, but we did these back in February and they still look and behave the same as they did 8 months ago. I'd be curious if anyone has any different experience - please reply to this thread if you do! I did your recipe for the purple jar but mine only takes 50 seconds to settle. I used Darice glitter but maybe it's too big? I couldn't find any fine glitter at my local craft store. Darice glitter is what I used first and, you are right, it settles really quickly. If you can't find fine glitter, you might want to try to use one of the glitter glue recipes. I know Elmer's has glitter glue in a variety of colors. how come different colors have a different recipe? We were experimenting with getting the glitter to settle at different times. I'm so glad this was helpful to you! Have fun! Thank you so much for the recipes! ^_^ I just bought some reaally fine glitter and I'm gonna try making some glitter jars. :) One problem I have: in my country finding corn syrup seems to be super tough! o.o So is there anything else I could use instead of corn syrup? Could I use maple syrup? Its so fun to hear from readers in other parts of the world! Where are you? Depending on where you are, maybe honey? agave syrup? Ookay, I'll have to try those two if I can get my hands onto them. :) Honey is easy to get. Golden syrup for the international folks!? Its easy to find cheap free and clear soaps. I tried laundry soap last night and it worked well but its took quite a bit of it. Thank you so much for the details, especially about corn syrup being a more economical choice! how far did you fill the jar up with water once you added all the ingredients? Thank you so much! I will be using this for my wedding! but miniature size, as place settings. I cannot wait to try this and I will re-post soon as I have finished a batch! These are so cool! I love that you timed all the different recipes - what a great idea. One of our CraftFail readers gave them a try, and says she might need to give it another whirl - the first attempt didn't turn out so well. So. My friends and I made four of them today with different colors and sequins and other random things in them and we were looking at them during story time before bed. Then when the lights were turned out we went and got a flashlight. And OH BOY! Shining lights on them in the dark is SUPER COOL. Especially when there are several colors. Any tips on how to make the settling of the glitter last for hours? I am wanting to do something like this for a reception decoration. Love the idea. I'm not sure exactly what the recipe would be, but I would play with adding more salt and more of the corn syrup/glycerine until you get the settling time you want. Good luck! How many oz of solution would you estimate each recipe yields? I'm playing around with different size containers. My daughter will be 2 tomorrow, and I'm adding these as a gift with all of her other sensory items. She has a chromosome disorder and has delays related to that...so these items are VERY helpful to her! Thankyou for posting such great intructions! This is a great thing, your helping lot of people to learn something fruitful. is the glitter suppose to sink to the bottom or float up to the top after you shake it? The glitter sinks to the bottom (though a small amount will stay on top). hey! i think your page is awesome... thank you for providing informational blog article. i have you bookmarked so i can return from here with no hassle to check out new stuff you post. Just wanted to say thank you for these recipes. I am a Behavior Consultant working with children and their challenging behaviors and am always trying to come up with new proactive strategies to help my clients! The fact that you gave estimated times for the glitter to settle is PRICELESS! Keep these great ideas coming! You can use gelatin to add color and thicken the water a bit. Salt works well to slow the settling rate. If you are ambitious enough it is possible to add a solar powered light to the cap to create night lights or glitter lamps. I am making these to place on tables at a party. Adding in battery powered LED's to make them into a sort of liquid votive. It's so great that you've got the kids making them, I'm sure they loved playing around with the glitter! And an amazing result too! Fantastic and much-needed post! Thank you so much for going into such depth so that this post can be a science lesson aswell as a guide for people looking for a behaviour modification tool. Wonderful work. Thanks for your blog. I just landed up in your blog and I really appreciate your blog. It is full of resourceful information. Thank you so much for the detailed research. I like the idea of using less-expensive corn syrup (I have used glycerin in the past). I was wondering, though, if after time, the jars would spoil because of using foodstuff. Any thoughts or experience in this regard? Aw, these really are the sweetest! Thanks so much for the tutorial! The information which you have provided is very good. It is very useful who is looking for Dry Syrup Bottles. You are an awesome blogger. This is one of the best blog I had visited so far. Hope to read more post fro you in the future. Keep it up. God bless. I love that there are multiple recipes on here. I can't wait to try them. Thank you for sharing. This looks like such a fun craft, the children look like they're having a blast! What a great idea! I'm a big lover of glitter myself (must be nostalgia from my youth) and I think these would be so fun for the kids! So excited to report that my Dollar Tree sells 3 bottles of glitter glue for one dollar so I was able to use a whole bottle, hot water and food coloring for each water bottle sized one and it lasts about 4 minutes for less than $1.00 per jar!!! Since I need to make 35 this was super cost-effective!! Jam Jars can be used for home canning and food preservation. They can be used to preserve or store items as diverse as jam, pickled gherkin, other pickles, marmalade, sundried tomatoes, olives, jalapeño peppers, chutneys, pickled eggs, honey, and many others. Thank you for the fun post! The science at the end makes it so cool. I hope you don't mind, but I linked to this post on my preschool blog. On the post I talked about a really fun book that fits the idea of being calm. Please feel free to check it out. Thanks for this incredibly helpful post! All of your tips and observations were spot on! My daughter and I really enjoyed doing this project together. Cheers! wonderful,A great deal of work has gone into this, so thank you. Couldn't leave without leaving you a comment Well done. Does it make a difference if it's dark corn syrup? H2O PET PACKAGING : Our business model is designed to make packaging easy for our customers . We can find it, design it, source it, make it, ship it, store it, and more . I got super idea science thursday glitter jars use! It turned out really cute! Decorative jar - Get the best deal on solar jar, solar jar lights, hanging solar lights, jar decorations, decorative jar, gift jar, garden jar, mason jar solar lights, table decorations & tabletop decorations at amazon.com from great selection at Sogrand Industry Inc Store. Jar decorations - Get the best deal on colorful jars, solar jars, solar jar lights, gift jars, jar decorations, decorative jars, hanging solar lights outdoor, mason jar solar lights, solar lanterns & jar lights at amazon.com from great selection at Sogrand Industry Inc Store. Mason jar solar lights, - Get the best deal on jar decorations, solar jar, solar hanging lights, mason jar lights, mason jar solar lights, solar mason jar lights, decorative jars, jar solar light, gift jar & solar jar lights at amazon.com from great selection at Sogrand Industry Inc Store. Garden jars, - Get the best deal on party jar, bar jar, mason jar solar lights, solar mason jar lights, tabletop decorations, solar jars, solar jar lights, table decorations, garden jars & gift jars at amazon.com from great selection at Sogrand Industry Inc Store. solar jar - Get the best deal on solar jar , solar jar lights, hanging solar lights, solar glass jar, solar lanterns, solar hanging lights outdoor, hanging solar lights, mason jar solar lights, garden jar & jar decorations on amazon.com from great selection at Sogrand Industry Inc Store. Solar glass jar - Get the best deal on solar jar, solar jar lights, hanging solar lights, solar glass jar, solar lanterns, solar hanging lights, hanging solar lantern, mason jar solar lights, garden jar & jar decorations on amazon.com from great selection at Sogrand Industry Inc Store.